Getting serious with cycling places a lot of demands on the cyclist, but with the Gore Bike Wear Men phantom 2.0 Windstopper softshell jacket, some of this demands can be easily and satisfactorily met. A proper jacket for cycling is one you will always be grateful for especially when it is windproof and water resistant. These two features alone guarantee you warmth and comfort in an outdoor activity in diverse weather conditions. 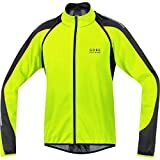 I think our Gore Bike Wear Windstopper Jacket review covers all the required options that your desire. For a long time, the Gore Bike Wear brand has been the leading manufacturer of sport wears in Germany and Europe. They specialize in sports gears for part-time riders to the full-time mountain bikers and up to the professional road cyclist. This jacket is designed to withstand all weather conditions without compromising. Ever since the inception of the Gore Bike wears, it has received 30 honors and more from the prestigious and famous European cycling magazine. Known for its quality, they have introduced materials such as the GORE-TEX, Windstopper and some other technical fabric that are reputable to the sporting world. Their inventions and contributions are why we enjoy the sport we love today in a comfortable way. The Gore Bike Wear Men PHANTOM 2.0 WINDSTOPPER Soft Shell Jacket is one notable creation of the Gore brand having some amazing features. Its designs are hinged on providing warmth and protecting the cyclist from harsh weather conditions. This is the kind of product that cannot be easily ignored if you are an intending to become a serious cyclist. Warmth and protection in unfavorable weather conditions, as well as comfort, are needed for a smooth and enjoyable ride. Although this bike is a little bit on the high side, it offers lots of benefits, and for this, you won’t worry about the cost. You can only get the full functionality of this jacket features as a cyclist but can’t say the same for casual wearers. 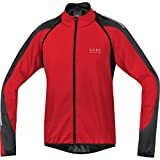 Gore Bike Wear Men PHANTOM 2.0 WINDSTOPPER Soft Shell Jacket features the zip off sleeves very serious cyclist, a wood proof jacket, ves, and a jersey. In a word, this is an all in one product! The Windstopper shell of this Gore Bike Wear offers complete resistance to the wind and at the same time gives the cyclist breathability. In addition to this, the comfort provided by the soft-mid layer and its water resistant ability makes this sports gear a handful. For added comfort during cycling, the phantom 2.0 windstopper soft shell enables you to freely move for optimum performance in a wide range of biking activities and diverse weather situations. The windstopper active shell technology offers great comfort in an outdoor activity. It’s total protection against wind combined with water resistance as well as maximum breathability enhances performances. A better performance contributes to reasonable lower heart rates, and consequently, that improves efficiency. The red areas on the jacket indicate that the windstopper can resist the wind and for this reason, you will stay comfortable during an outdoor activity. This alone contributes to maintaining the level of your physical activity. Whether you are sure or not of what the weather brings your way, you will need a jacket that is versatile enough and ready for anything. The removable sleeves of this jacket become very useful when the weather turns normal. With these sleeves, you no longer have to worry yourself about your arm warmer slipping off when cycling which exposes your skin. One good thing about these removable sleeves is that they are easy to zip off and kept in your pockets when they are not necessary. Such a simple but great idea! Q: How stretchable is this Jacket? I am 5’7” with 45” chest and have a waist of 33” waist. Q: Is this jacket waterproof? A: Not really but it able to handle light drizzle, but in constant it will eventually get wet. Q: Can the sleeves be removed completely? A: yes, only if you want to. It can be detached completely. With its reflective strips for safety, this jacket has a longer backside that keeps your waist warm. Anyways this jacket is cheaper than the phantom 2.0 windstopper men’s jacket. just like the Gore men’s jacket, this also features wind and water resistivity and softshell technology. The major difference between this jacket and the Gore brand is its front zipper pockets. The modern technology and the advanced innovations of this Gore Bike wear have contributed immensely to the growth and development of the cycling world. With this attire, you are guaranteed breathability, comfort, and warmth in outdoor sporting activities as well adjustability in stable conditions. You can rest assured as the Gore brand wears have received more than 30 honors as they offer high-functional clothing for cycling.